Yep, I must admit it my sister is a clown. Here she is with my therapy dog, Mohave. Yep, he was a clown too. 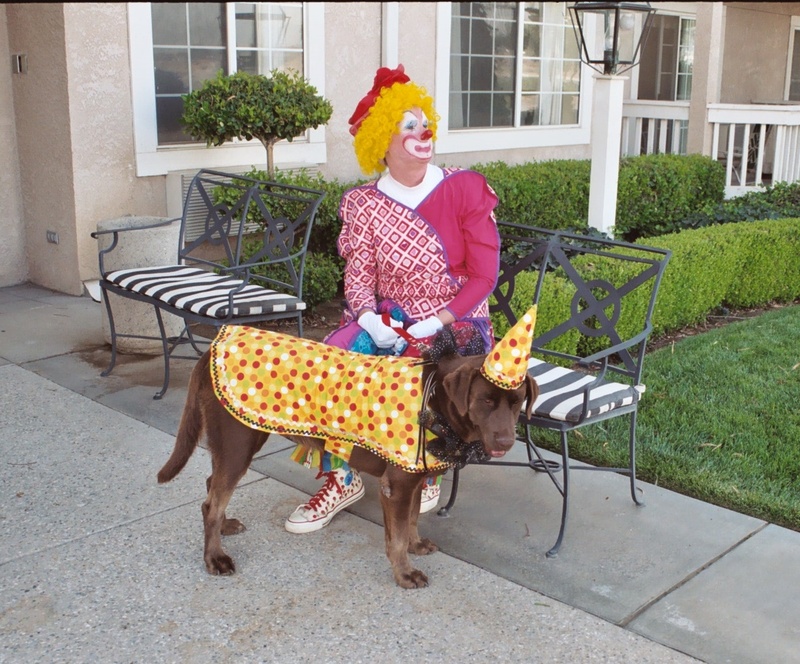 When I found out she was coming to visit and she had finished clown school I asked her if she wanted to come along on our visit to the nursing home. She is very religious and is wonderful with people. Her quiet approach to touching peoples lives is commendable and one of her best traits. I cannot remember laughing with my sister that way, well ever. We laughed till our sides hurt. We were laughing so hard I may even have peed my pants a couple of times . Of course I made her wave and make funny faces to all the people in cars along the route to the facility. It wasn’t hard cause SHE WAS DRESSED LIKE A CLOWN!!!! 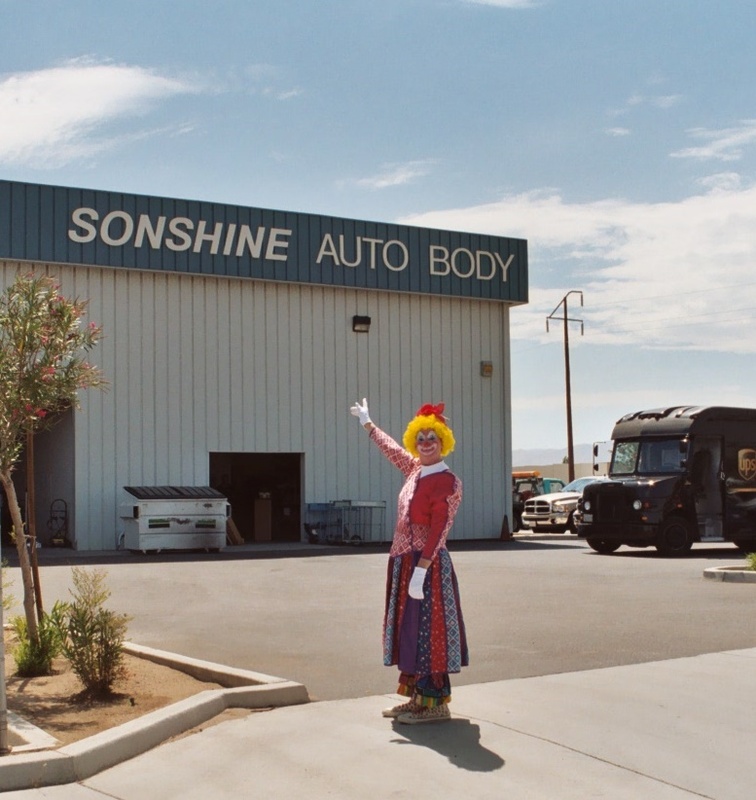 Her clown name is Sonshine and while we were driving around we saw a auto repair shop called Sonshine and we just HAD to get a picture there. I also made her drive MY tractor (yes I have MY own tractor, a story for another day) Well she didn’t really drive it that would have scared me. I let her sit on my tractor while I took a picture. Mohave and I had one more event we had to attend. It was a lecture on what kind of jobs at-risk teens could get when out of school. I, of course told about how they could train dogs and the different jobs one could have in the dog field. Mohave was so well trained all I had to use was hand commands. He was always so impressive. My sister told them about becoming a clown. I wonder how many chose the clown field? What great memories these pictures bring. Mohave has been gone for three year but how lucky am I to have these great memories? This post started out to be picture of Mohave turned into a tribute to the greatest sister ever! On this Thankful Tuesday I am thankful for my sister, the clown! She is such a blessed soul that I am blessed to have her. I hate that she lives so far away. We are blessed! Yes we are! 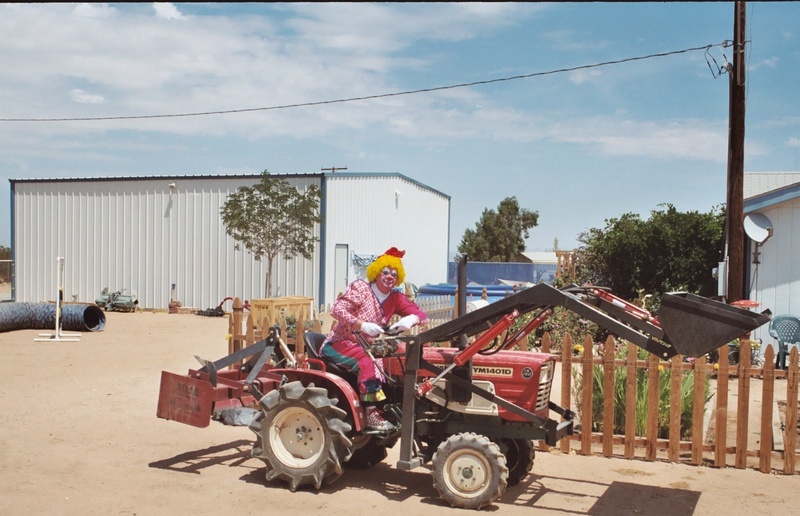 Honestly, I’m kinda afraid of clowns, but your story was fun…definitely will try and conquer that fear. Loved your tribute. You know I am usually too! But it is not so bad when your sister is the clown. lol Thanks for stopping by! Like the clown on a tractor pic 🙂 How did you manage to persuade your sister to turn up for that one? Well, Sonshine will do anything for a laugh! That pic was certainly worth a few laughs. Sisters ROCK! I treasure mine completely. WE are the lucky ones to have such great sisters! Indeed. I just talked to mine, as my dad can sometimes make hurtful comments and I wanted her feedback on one he made yesterday and a caring way to tell him about it. She is so wise.